I have to admit, I am not the biggest fan of the traditional pumpkin pie. 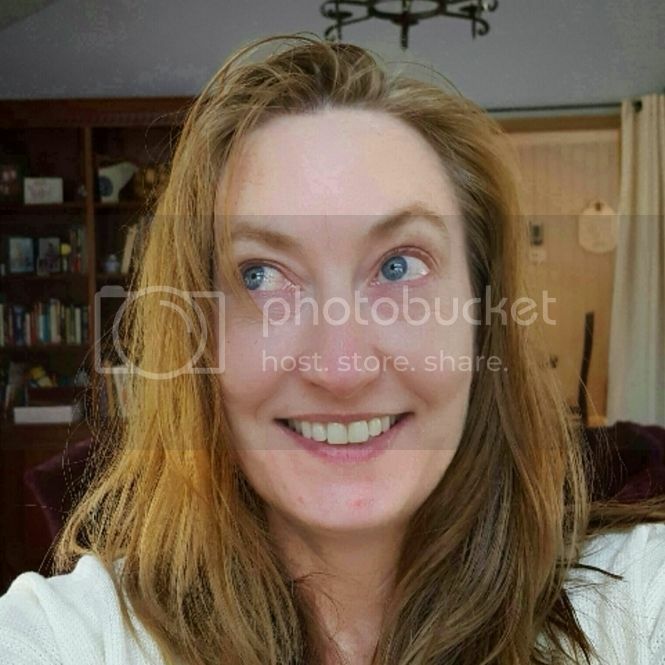 I love the taste – don’t like the texture. Cinnamon or pecan rolls are traditionally cinnamon. I wanted a little extra for all the PSL lovers. I also wanted to finally use my Penzeys pie spice! Substituting cinnamon with Penzeys (or your favorite mix of pumpkin spice) creates a pleasant surprise all your holiday guests! There is an extra kick with the mace and anise. 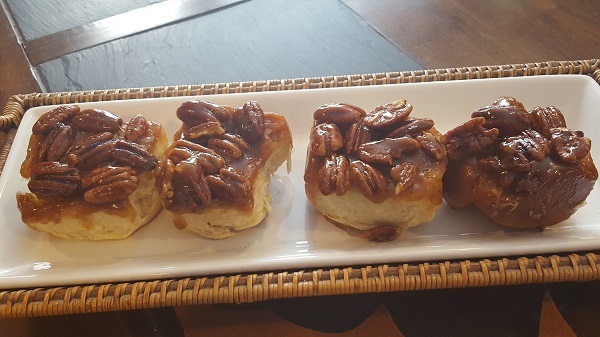 For this Pecan Roll, I went a step further and used canned pumpkin instead of butter for the filling. My daughters assumed it was a disaster. But it worked perfectly! It cuts a little of the fat (very little), but none of the moisture or flavor. 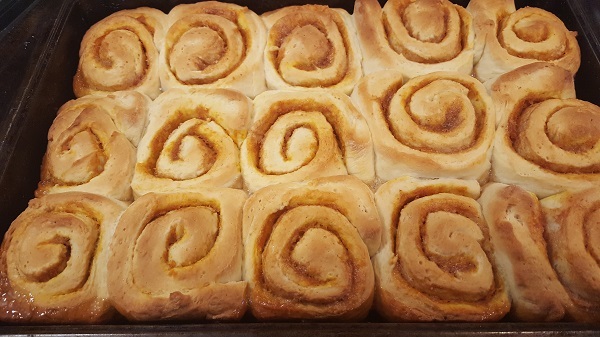 Rolls can be warmed the next morning for a holiday breakfast, or the raw dough can be kept in the refrigerator overnight and cooked in the morning. 2 Packets yeast, or 4 ½ teaspoons, or ½ oz. 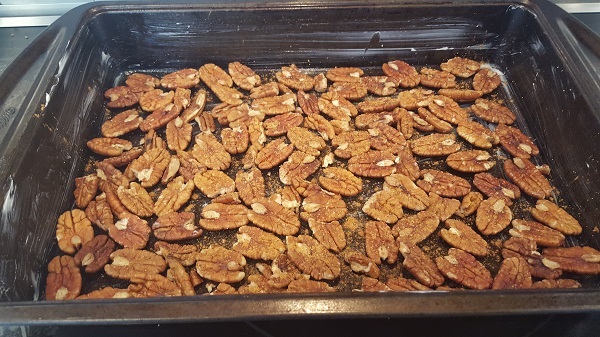 1 Cup of pecan halves (8 Oz). Chop if you prefer smaller pecans as a topping. Mix 3 ½ cups of flour, sugar, salt, and yeast in a mixer. Add the butter, egg, and warm milk. The dough should be sticky, but starting to pull away from the bowl. If the dough is too sticky add up to another ½ cup more flour. Turn the dough onto a well-floured cutting board and knead for several minutes, adding flour if it sticks to the surface. Place in a well-oiled metal or plastic bowl, turning to coat with oil. Cover bowl tightly with plastic wrap and place in a warm area. Let rise until doubled, around 90 minutes. Butter a 9 X13” pan and lay pecan halves on the bottom of the pan. If you prefer, used chopped pecans. Place the brown sugar and butter into a saucepan. Heat until butter melts completely. Stir and remove from heat. Mix sugar and Penzeys Pie Spice mix for filling. Set aside. Open canned pumpkin and set aside. Reheat the brown sugar and butter until it starts to boil. Immediately remove from the saucepan from the heat and mix in the corn syrup and milk. Add ½ teaspoon pie spice. 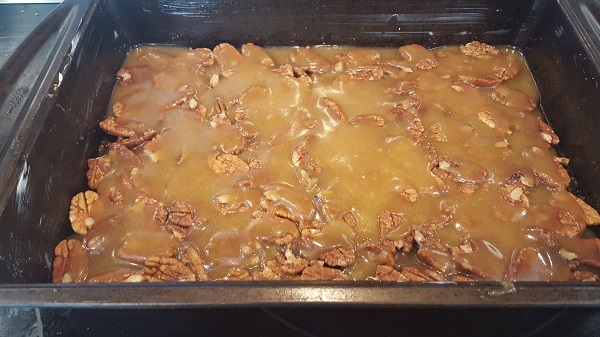 Pour mixture over the pecans in the 9 X13” pan. Once the dough has risen, move the dough to a well-floured surface. 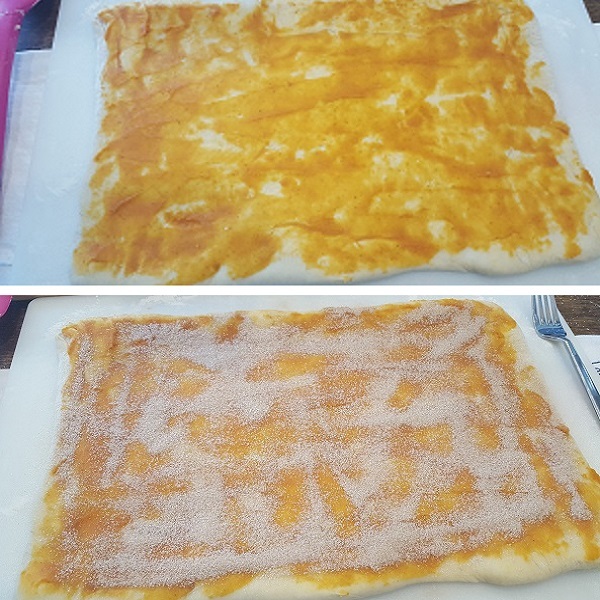 Using your hands and a rolling pin, make a 10” X 15” rectangle. 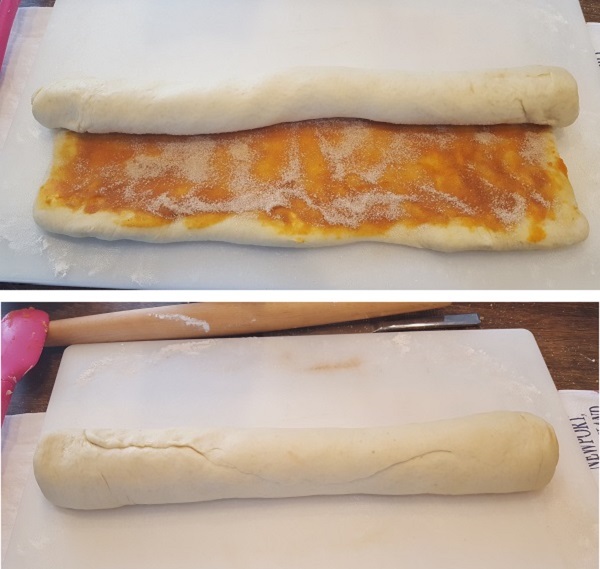 Spread 3 tablespoons of pumpkin puree over the dough. Evenly sprinkle all the spiced sugar mixture over the pumpkin. Starting at the 15” edge of the dough, roll the dough into a log. 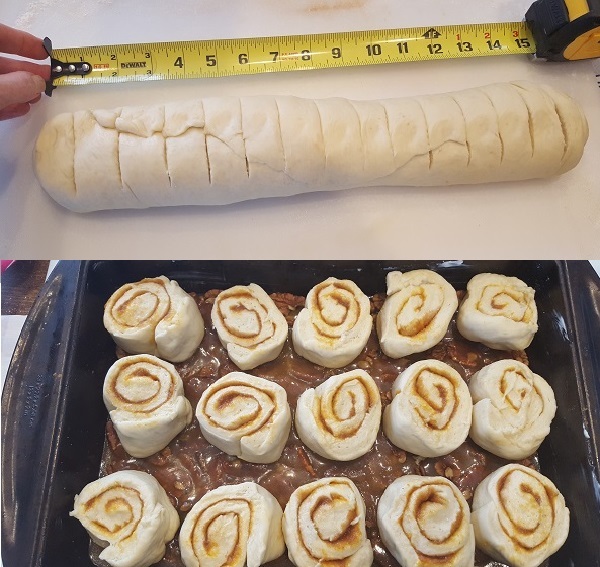 Cut the dough into 15 – 1” pieces. *At this point, you can store the dough in a refrigerator overnight. 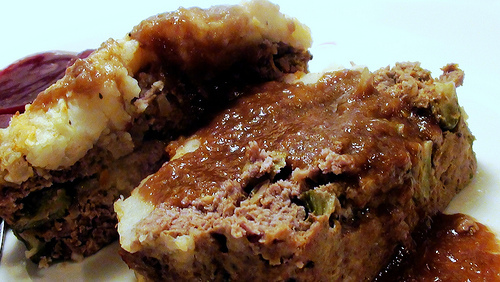 Bring to room temperature the next day and if needed, allow to rise before placing in the oven. Preheat the oven to 350 degrees. Bake for 30 -35 minutes after the second rise. After the rolls are a golden brown, remove from oven. Let the pan sit for a few minutes to let the topping cool and he rolls contract from the pan’s sides. Place a large cookie sheet over the 9 X13” pan and flip the rolls onto the cookie sheet. I cover the cookie sheet with wax paper or parchment for easy removal. Let the pan cover the rolls from a few minutes to ensure the topping spreads down the rolls. After removing the 9 X13” pan, use a fork to pick up any stray pecans remaining in the pan. 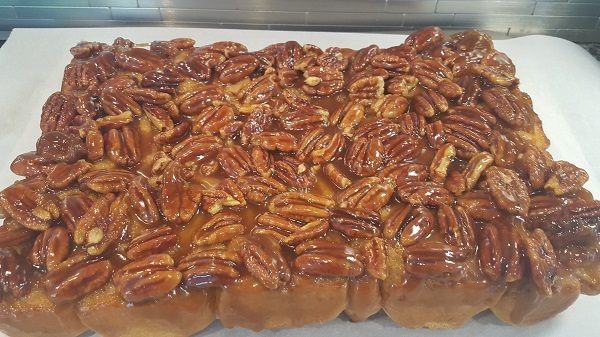 The pecans and topping will be hot enough to burn you. Sprinkle the block of rolls with additional Penzeys pie spice. 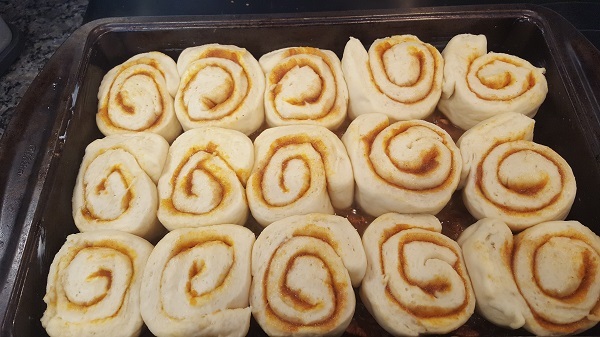 Gently separate the rolls from their rectangle and enjoy warm!